Mr. Rauramo has been Chairman of the Board in Sanoma for 4 years and together with the board they have managed the crisis in a perfect manner. The strategy of having business in over 20 countries abroad has decreased the company’s overall financial risk. Finding the best Chairman is based on a local jury, 13 pre set criteria, and data from a market survey with 36 questions among board members. Mr. Rauramo is very experienced, dedicated to develop the work of the board, uses his time and is very committed to promote the company, as a chairman is very capable of leading the meetings effectively, very strongly strategically oriented and gets everyone in to the discussions. His successes speak for him as well as the esteem he has earned both outside the company and among employees at every level. Highly competent and engaged, not afraid to make bold decisions when needed. In spite of his age more ahead of the time than most others in the company. He is very driven by concern for the company. He gains great respect for his personal integrity and he is mature and has authority. Harri-Pekka Kaukonen, with the challenge to succeed with Sanomas long-term financial target: To grow net sales faster than the growth of GDP in their main operating countries. To be more profit oriented the board of Sanoma has a weighty financial reason for the issue of 1,369,200 stock options to 294 executives and managers of Sanoma Corporation and its subsidiaries. Since the stock options are intended to form part of the incentive and commitment programme for the executives and management. The purpose of the stock options is to encourage the executives and management to work on a long-term basis to increase shareholder value and also to commit the executives and management to the Company. Sanoma has produced the first Corportate Responsibility Report in 2011 following the Global standards enabling comparisons to other companies. Sanoma believes that focusing on corporate responsibility issues will give them competitive advantage and increase their credibility and reliability. Sanoma also took part in preparing Finnmedia’s (the Federation of the Finnish Media Industry) Environmental guidelines, published in the summer of 2010. The guidelines aim at systematic development of environmental management, active communications about the environmental impacts of media products and services and better energy and material efficiency. Raisio Board membership: member and Chairman since 2006 and several board positions. The share of women is 40%. In the other Nordic companies: Ekornes, Norway 40%, (ref “the Gabrielsen” law) Getinge Sweden 30%, Carlsberg Denmark 0% and CCP Games Iceland 0%. Comparing the Nordic numbers of board meetings: Sanoma had 9, the other Danish had 5 meetings and Swedish candidate had 8, the Norwegian candidate had 9 meetings and all candidates arranged a 2 days strategy seminar. Chairman of the Human Resources Committee and the Executive Committee Joined Sanoma Group in 1966. Served as President and CEO of SanomaWSOY 1999–2001, President of Sanoma Corporation 1984–1999 and was elected to its Board in 1979, Sanoma Corporation's Executive Vice President, General Manager of the Newspaper division and General Manager at Sanomaprint, among others. Sanoma is a strong European media company. They operate in more than 20 countries, offering an inspiring working environment for nearly 20,000 people. Sanoma’s shares are listed on the Nasdaq OMX Helsinki. Sanoma has three areas of business: media, learning and retail. They are among top 5 consumer magazine publishers and number 6 in providing learning materials and solutions in Europe. In Finland, they are present in all fields of media. Their retail operations include kiosks, bookstores, movie theatres and trade services. Sanom meet the changing needs of their customers and business environment by constantly developing their products and services. This innovative approach ensures sustainable growth and profitability. 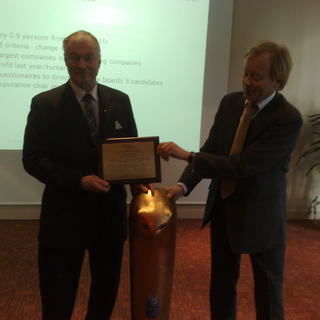 By the end of 2010 Styreinformasjon as have awarded 23 Chairmen of the Year in the Nordic countries. They will be excellent candidates for board positions in other Nordic companies and increase information and innovation flow in the Nordic board rooms. Risto Siilasmaa F-Secure Oyj received the Nordic Award 2009 from Henrik Birk, Nordic Council of Ministers.